Watch Donald Trump offer irrefutable evidence that he’s definitely not racist or anti-Semitic. Forget what you’ve heard: Donald Trump is not anti-Semitic or racist. This was made clear in an astonishing press conference on Thursday, which delivered irrefutable evidence obliterating all ideas to the contrary. What was the irrefutable evidence? Donald Trump said so. That was as far as he got. 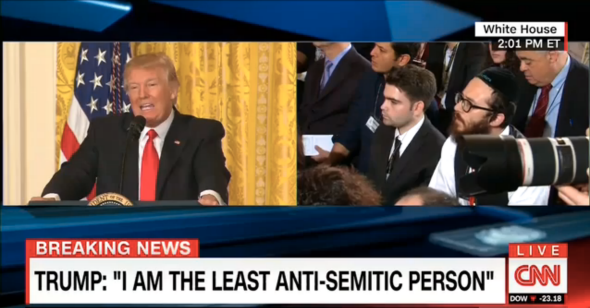 Apparently convinced he was being accused of the grave sin of anti-Semitism, Trump pushed back. Turx continued to try to get a word in, but Trump talked over him: “Quiet, quiet, quiet,” he said. He cited his support from Benjamin Netanyahu as supporting evidence, and called the question “very insulting.” He also refused to actually answer it. Next. A couple questions later, Trump called on April Ryan, White House correspondent for the American Urban Radio Networks, who is black. “Oh, this is going to be a bad question, but that’s OK,” Trump muttered audibly. When Ryan asked about what he was going to do to fix the inner cities, as he had promised, Trump seemed surprised and relieved. “That was very professional and very good,” he said. It was late. The press conference—apparently impulsively scheduled that morning to announce the new labor-secretary pick—had gone on for well over an hour, including such bizarre turns as Trump testifying to the unique terribleness of a nuclear holocaust. Trump seemed weary, his self-control even more frayed than usual. Ryan’s question would end up being the next to last. But consider for one moment what their improvisational little exchange implied. First, the president made a casual assumption that a black journalist could not possibly ask a “good” or “professional” question. Then he insinuated that in her spare time, a White House correspondent would set up a meeting for him with members of Congress whose January letter he had ignored. Finally, he perpetuated the classically blinkered belief that America’s huge and enormously diverse black population all somehow know each other. It was lucky that he had already established that he was the least racist person. Otherwise, somebody might have wondered.